A well-known, historic landmark in vibrant Downtown Santa Ana, The Yost Theater has been one of the oldest and most influential event venues in California since 1912. Fully restored by our client, 24 Carrots Catering and Events, its historic roots and 20’s décor were modernized with traditional touches to elevate the guest experience. 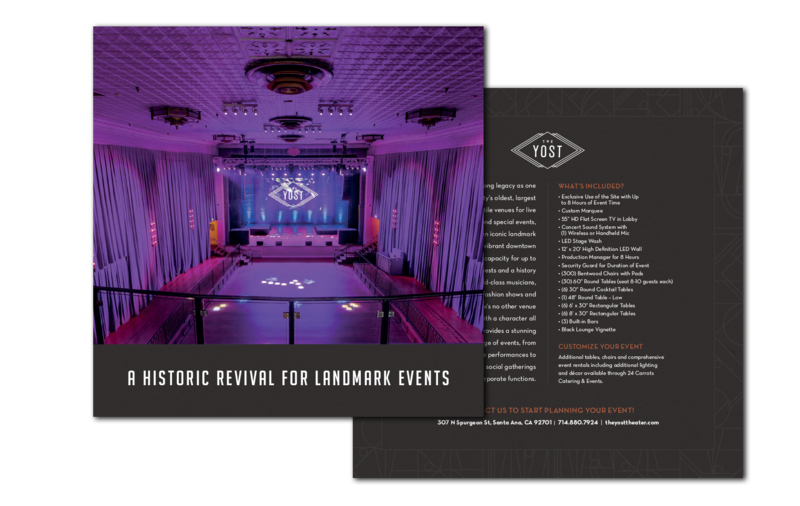 Album partnered with 24 Carrots to refresh The Yost venue branding and reposition it as a beautiful, historical setting for all types of large events — from concerts and live performances to upscale weddings, socials, and corporate functions. A new identity was created, including a modernized logo, new brand fonts and colors. We then designed and built a fully responsive website, and created branded materials and signage to support the Grand Reopening. Oh and by the way, this brand and others have led us to be recognized as a top branding agency on DesignRush. The chosen logo design was inspired by The Yost’s iconic marquee.